So much nostalgia in one tiny box. Hello all, and welcome back to the newest (and long overdue) “Back in the TAY”, where I venture back to yesteryear and play through some games of our childhood. This weeks review is a double hitter; not only is it the first console I ever played growing up, but it is also a rare treat to come across in the wild. I lucked out in picking this beauty up last Friday, and while I was torn on selling it for some quick cash, decided that I wasn’t a scum bag that takes advantage of those less fortunate. Now, lets jump into this beauty! Everything fits so snuggly in there! I have to give it to Nintendo; they managed to include EVERYTHING you need to boot this console up in the box. No additional power adapter needed, no HDMI cable missing, and it comes with a USB cable. One little point I would like to note is that the power cable is simply a Micro USB cable, just like you would use for a smartphone or your Dualshock 4. The power draw on this system is so small that I don’t even use the power adapter and have it plugged into the USB port on my television. This set up is self explanatory, requiring little effort to get it fired up for your first run. The NES Classic was something of a God send to older gamers, by taking a beloved console and updating it to run on newer technology. This tiny box comes filled to the brim with 30 classic games, some of which I did not have the pleasure of playing as a child. My family had the NES when I was really young (roughly 4-5 years old) and it belonged to my older sister, who played it religiously until she decided games were no longer her “thing”. A lot of these titles I did play, and perform just as well as it did back then. Now, before I run off on a tangent on the games (which I will be doing in the upcoming weeks), lets take a look at the system itself. Now, as I stated above, it is small. Really small. While it can easily fit in your palm, Nintendo paid enough attention to make it to scale of the original system. Guys wanna play Super C with me? Now as you can tell, the ports are similar to those of the Wii mote, and thus making the controllers work for Virtual Console games as well. While it is a cool feature, I for one no longer own a Wii to thoroughly test that out. The controller, however, feels as authentic as you would expect from Nintendo. The buttons, D-Pad, and the plastic all feel like something from the 80's, back when things were made from Nintendium. Weary of using it because of the sheer scarcity of the console and official controllers, I have been using 3rd party ones in the meantime, which I will be reviewing next week. The console boots up like a dream, and pulls up a quick menu to select your language. One thing I did find out was that the Japanese system offered 8 different titles from the European and American console, which helped make it feel more authentic in each region. Another feature I liked was being able to choose the screen filter, such as adding a CRT scan line effect to the system. A cool little nod to the good old days, even if it was something I used for roughly 15 minutes. The layout of the games is easy to browse, and gives you the option to change the order (Release, Title, 2 Player, and Times Played). I tend to leave it on alphabetizing to make browsing easier. This system takes a few cues from emulators, but the most noticeable one is the fact you can do a save state for each title. Reach a certain point in Ninja Gaiden without dying? Save it! You no longer need to worry about finishing a game in a single sitting. Look at those scan lines! The titles that come loaded on the system are all classics in there own way. We have arcade titles like Balloon Fight, Pac-Man, and Donkey Kong. Action games are covered by Super C, Gradius, and Casltevania. Platforming is all taken care of by the three Super Mario Titles. Role playing games are covered by Final Fantasy, Startropics, and Zelda. It does come with a couple of questionable choices: Zelda 2 and Castlevania 2. Castlevania is by far one of my favorite series on the NES and SNES (followed closely by Metroid and Ninja Gaiden), but why include the second title and not the third? I know the 3-in-1 Retro consoles have issues running it, but this is an in house endorsed Nintendo console. Just a little complaint of mine. Also, why not include Tetris? Sure, we have Dr. Mario, but not Tetris? Alright, rant officially over. “Blast from the Past”is right. The games played flawlessly, or as much as you would expect a NES title to play. The sounds, the graphics, and the controls were all as I remembered them to run. The familiar chiptunes of Castlevania, Super Mario Bros. 3, and Metroid were all there and just as fantastic as you can imagine. The only time I noticed any sort of hiccup in a title, it was because of the controller I was using and not the title itself. All in all, Nintendo nailed the quality of the titles. 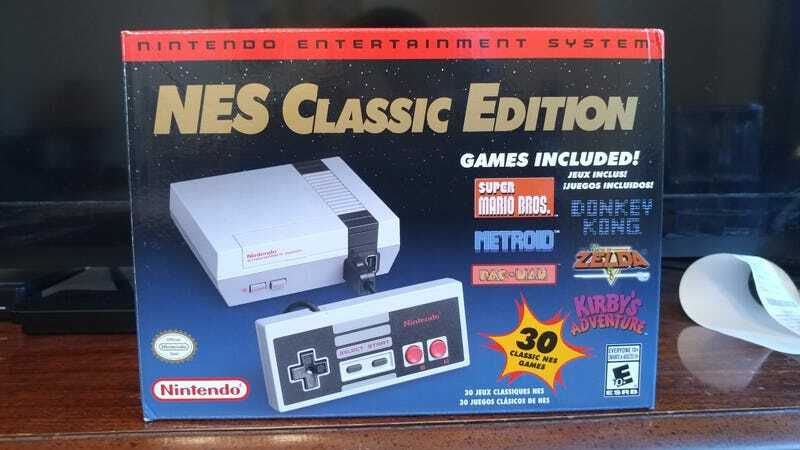 Overall, the NES Classic was the best surprise Nintendo has released in a long time, and was something I didn’t realize I wanted all these years. Sure you can make your own system using a Raspberry Pi and a 3D printed NES case, but it doesn’t feel the same. If the speculations and leaks are true, then I for one will be waiting Day 1 for their revamped SNES Classic. Super Metroid here I come! Tune in next Wednesday while I go through some of the third party controllers, and see if they are worth your hard earned dollars. P.S. - As a little treat, here is a QR code for a little link to all of the manuals for the titles. Enjoy a quick walk down memory lane!